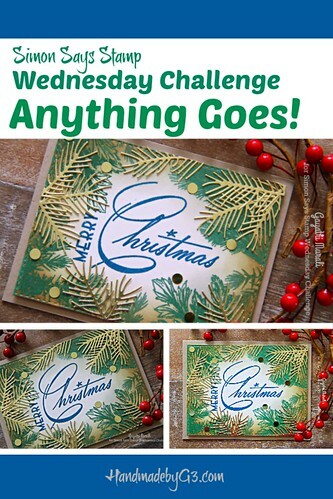 I used Tim Holtz’s Classic Christmas stamp set to make my card for the challenge. I heat embossed the sentiment from the stamp set using Simon Says Stamp Deep Sea dye ink. I used MISTI to stamped the sentiment in the dye ink followed by versamark then clear heat embossed the image.On the edges I embossed the foliages from the stamp set using Simon Says Stamp Evergreen dye ink. I followed the same process as I did with the sentiment. I die cut the panel using the largest of the Simon’s stitched rectangle die. Then sponged the edges of the panel with Forest Moss and Vintage Photo distress inks. This adds depth to the panel. 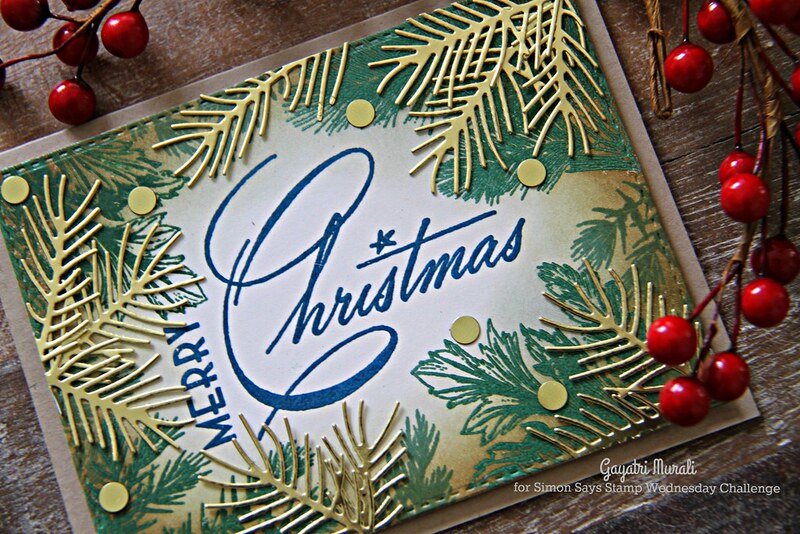 To add dimension I added Simon Says Stamp’s Pine Needle Trio die cuts in gold foil. Options are to gold heat emboss the foliage images from the stamp set or add die cuts. I chose to add the die cuts. Easier option I guess. I also added some gold confetti for added bling and festivity to the card. I adhered this panel on the kraft card base. I love this colour combination. 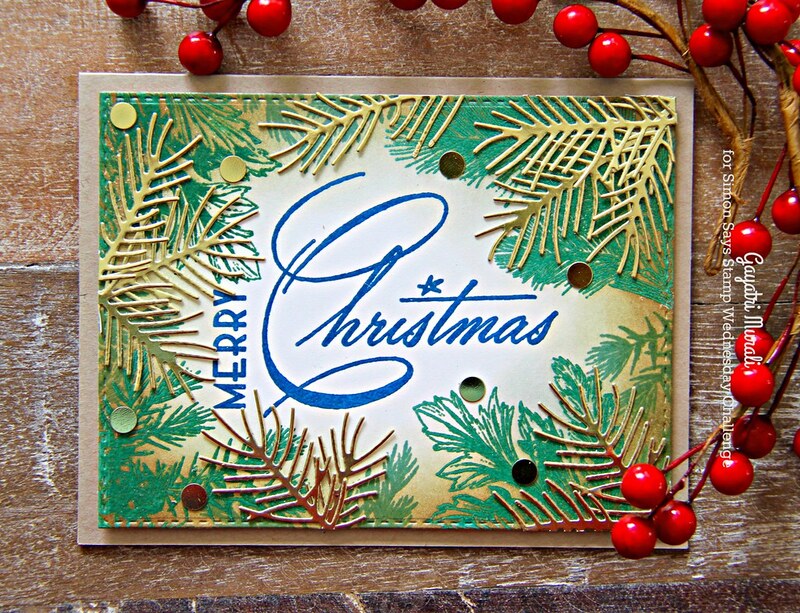 By altering just one colour and keeping the rest as traditional Christmas colours, the card fits in both the traditional and non traditional category. Thanks for stopping by my blog today. Have a wonderful week! 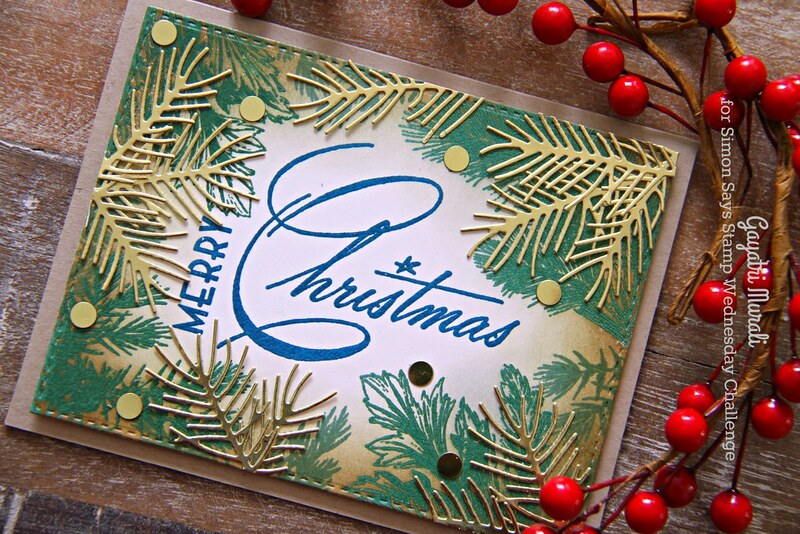 This is such a fun font, Gayatri – love the gold pine boughs, too! Wow, amazing festive card! The gold with the green are so elegant!